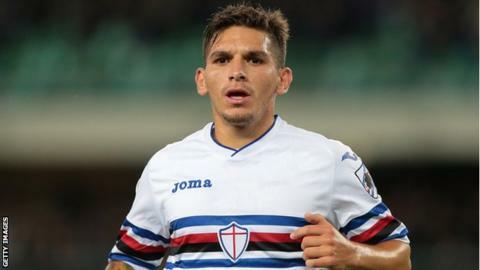 Several reports are claiming Arsenal have agreed a deal for Sampdoria midfielder Lucas Torreira, according to Daily Star. Arsenal’s new boss Unai Emery have been active in the transfer window as he has identified Uruguay international Torreira who has a £22m (€25m) release clause in his contract but the two clubs have reportedly settled on a £26.5m (€30m) fee, according to Italian broadcaster Sport Mediaset. The report further explains Arsenal are willing to pay a higher sum so they can spread out the payments in installments. Despite the reported agreement over the transfer fee, Arsenal are yet to agree personal terms with Torreira. Torreira, 22, is seen as one of Serie A’s most talented young midfielders, a modern playmaker who can win the ball back as well as distribute it. The Uruguay international arrived in Italy as a striker, described at the time as the new Carlos Tevez because of his combative style, and joined Perugia in 2013. There, however, he was moved into midfield by the coach and 2006 World Cup winner Massimo Oddo. The Gunners have signed Swiss defender Stephan Lichtsteiner on a free from Juventus, while a move for Borussia Dortmund’s Greece centre-back Sokratis Papastathopoulos will be confirmed in July.